If you are on your way to a camping trip, having a reliable camping tent is important. The first thing you should ask yourself is, “What kind of tent should I buy?”. Among your camping activity essentials, a tent is something you must not forget. It acts as your shelter, protecting you from external danger and keeping you warm in your night sleep. Depending on certain conditions, there is a wide variety of camping tents you can choose from. Each type offers features that can suit your needs. In this article we shall help you on how to choose tent for camping. Different designs of camping tents provide pros as well as cons. This type of tent is designed to take its shape and open up without any prior construction. It can house up to two campers. Furthermore, it offers ease in erection and use. With this, it is preferable for campers that are inexperienced. This type of camping tent is the most recognizable style. Most camper utilize this type of the over the years. Nonetheless, it becomes less common as it becomes an old-school choice. Ridge tents are notable due to classic shape. It consists of two poles on each ends which forms a triangular design. Should you prefer tents with additional area, a great choice is a tunnel-type camping tent. This type features a set of curved poles that create a lengthy and tunnel-like construction. In the case of tunnel tent vs. dome tent, you may get extra space with the former. The later, on the other hand, provides you better head room. Once the tent is set-up, it provides extra space for your camping gear. It also has a better head room compared with a dome tent. Nevertheless, they are heavier because of their size. As you spend a long day when hiking, it is important to build a tent for you to rest. A backpacking tent offer easy pitching feature that is practical for backpackers. They are great for a windy weather as it is compact and streamlined. Among the popular styles of camping tent, this type is identified with its curved poles. Its structure features up to three poles that are arched in a semi-circle. The poles create a rectangular or square base. This type of tent offers a great headroom due to its rising sides. Most tents with this design typically features a detachable sheet situated in the ground. This type of camping tent is the least known and common tent. Nevertheless, it is a practical tent that can be use outdoors. Bell tents utilize panels that are made from canvas. It is perfect during the summer or warmer periods as the material acts as a temperature regulator. Similar to the structure of dome tent, this type has extra poles which cross over creating an inner area. The structure provides a spacious ground area and offers stability. Geodesic tents can withstand rain and wind without the risk of collapsing. It is generally more expensive as it is preferable for tough expedition and conditions. This new tent type has an uncommon design. Despite having similar structure with tunnel tent, it does not feature poles. 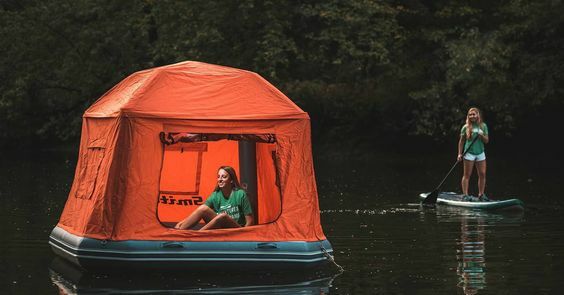 Inflatable tents utilize hollow panels that are filled with air. This forms a rigid and stable structure for the tent. For family camping trips, you can go with this type of camping tent. It can allow up to four people within its two sections. It also has a communal area where family member can stay doing tent activities. In general, there a number of tent types you can choose for you next camping trip. We recommend you check out each type’s features. These can help you select the right one that will address your camping requirements. As you decide to purchase camping tent, you must note each type’s features and advantages. If you need a tent that is fast to set up, you can go with a pop-up and backpacking camping tent. What kind of tent do I need? If you prioritize strength and stability, dome, geodesic and ridge tents can withstand extreme conditions. A bell tent is also preferable for warmer months. What size tent should I get? 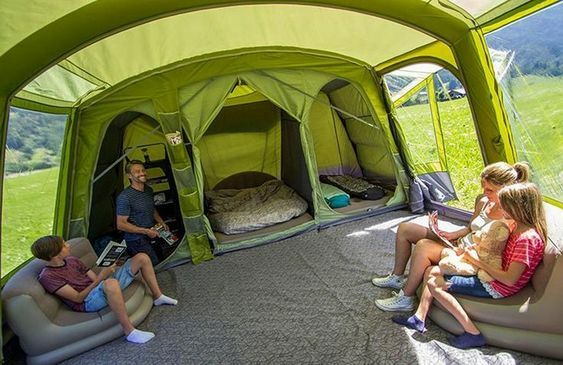 If you are going with your family or in a group, you can prefer tunnel and family tents.